The icy wind is blowing more than a gale at the top of Cecil Peak, at an altitude of roughly 1900 metres, and the ground is covered in snow. It's early spring but feels like an arctic winter and I'm thankful that I'm kitted up in warm, padded ski gear and beanie. I clamber onto a boulder then step gingerly up onto the small platform secured above it. It's little more than a metre square and at any moment I think I'm going to be blown right off. I line the golf club up behind the ball and steady myself to take the shot. Just managing to stay upright, I swing the club back then forward, and with a glorious and miraculous thwack the driver connects with the ball, which arcs then drops hundreds of metres below us. We can't see where it lands. I'm teeing off overlooking Lake Wakatipu, with the township of Queenstown dwarfed in the distance and the craggy peaks of The Remarkables a panoramic backdrop. Fortunately we haven't had to make the uphill schlep on foot to reach this point; instead we've arrived, in rather spectacular fashion, by chopper, courtesy of helicopter touring company Over the Top. Our adventure starts with a short car journey from our luxury digs at Matakauri Lodge to a deserted valley flanked on two sides by rolling hills. We wait there for a few minutes until we hear the sound of a helicopter in the distance and a sleek black craft lands metres from where we stand. After a quick safety briefing from pilot James Forward we climb aboard, putting on headphones and seatbelts, and head back down the valley before turning sharply to cut across a ravine. Suddenly Lake Wakatipu reveals itself before us and beyond it is Cecil Peak, where we land. When it comes to golf I confess I'm lured by glamour views. Not for me a regular 18 holes on a suburban links. I have zero interest in handicaps, and I don't really care if I connect with the ball or not; hit and giggle is an appropriate description for how I play the game. What I do care about though is the location. Golf, in my opinion, is a game that should only be played when accompanied by a cracker view. This hole gets my tick of approval. It's a crazy, wonderful concept. 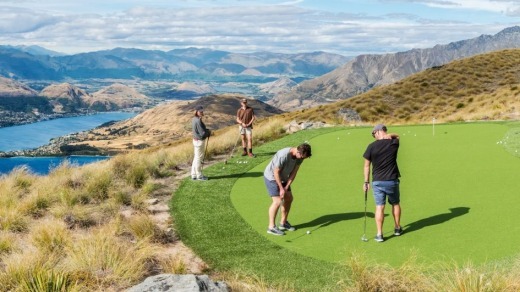 There are actually four par 3 holes you can play, but each of the tee platforms leads down to a single green on the lower saddle of Cecil Peak. Most golfers play just one hole, driving, chipping and putting down to the green, where the chopper flies down to collect them. The golf course, if you can call it that, was planned and constructed to ensure minimal impact on the landscape. The Srixon balls we use are designed to biodegrade – when I pick up an old one from a tussock of grass near the tee, it disintegrates immediately and my hand looks like it's covered in Liquid Paper – and an annual hunt by local scouts ensures this pristine environment remains just that. Golfing over, we climb back into our Eurocopter EC130. The wind has picked up and I confess to being somewhat nervous at take-off, but Forward puts us at ease. "If I'm not worried, you don't need to be," he says calmly, tipping the nose of the chopper downwards so it feels like we are tumbling off the hill. From the air, we get a unique perspective on the geography and geology of this region and an increased appreciation for its astounding natural beauty. Unlike the volcanic North Island, the mountains in these southern parts are glacial, which is why Lake Wakatipu is so deep and always looks so blue. Forget bungy jumping, white-water rafting and jetboating; seeing Lake Wakatipu and the mountains surrounding it from a helicopter is really the ultimate Queenstown thrill, although chopper flights at the best of times are not for the faint-hearted. We fly past the Remarkables and over Queenstown itself, towards the Shotover River where Forward points out that the tiny red specks crawling across the water are actually the famous jetboats travelling at breakneck speed. We also see the narrow winding road, one of the region's most scenic but worst maintained, that leads to the former goldmining settlement of Skippers Canyon before starting our descent. We redefine the term rock star park as we land at Coronet Peak, Queenstown's oldest and most popular ski field, to spend the rest of the day on the slopes enjoying fabulous spring conditions. 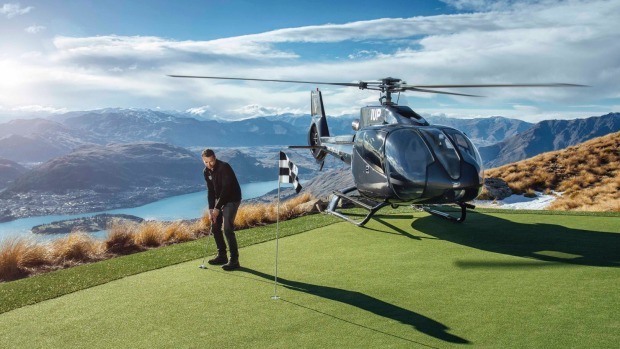 By car it's only 20 minutes from town, and a chopper isn't absolutely necessary – unless you're squeezing in a hole of golf too. Sally Webb was a guest of Over the Top, Virgin Australia and Matakauri Lodge.